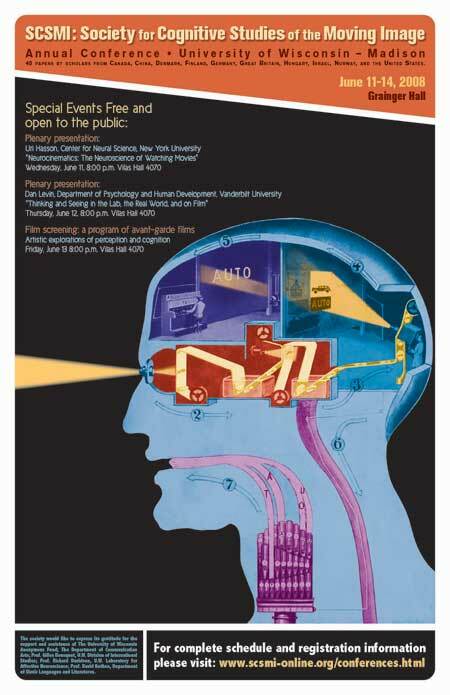 First, the event that will occupy us through next week: the annual conference of the Society for Cognitive Studies of the Moving Image, a group founded in 1997. This year’s gathering brings researchers from Britain, Germany, Hungary, Israel, Turkey, Canada, China, and the Nordic countries, as well as many from the U. S. The meeting is here in Madison, from 11 to 14 June. In over forty sessions, researchers will be talking about how we respond to movies, TV shows, and videogames. How has digital imagery changed our experience of cinema? How does film music enhance our emotional response to the story? How do films guide our visual attention to one part of the screen, and how much do viewers differ in this? How do we respond when movie characters behave inconsistently? I’ve already blogged and bragged about our event here, but now I want to highlight four attractions. If you’re in or near Madison, you might want to stop by; and in any case, you might want to check the links mentioned below. For some years Professor Uri Hasson of New York University’s Center for Neural Science has studied how the human brain responds during film viewing. Using fMRI techniques, he has discovered that Hollywood films, such as those by Hitchcock, have created remarkably similar responses across a variety of viewers. Art films, he says, may require just as much concentration, but they will elicit less convergent reactions. He’ll present the fruits of his research on June 11. You can learn more about Uri’s research here. On June 12, Professor Dan Levin will lecture on “Thinking and Seeing in the Lab, the Real World, and on Film.” Levin has been actively studying how viewers’ concentration, watching a film or in real life, encourages them to overlook actions or changes taking place in front of them. He showed the power of “inattentional blindness” in his famous “gorilla-suit” experiments. Filmmaker Errol Morris recently interviewed Levin for The New York Times about continuity errors in films. You can read more of Dan’s fairly mind-bending work here. 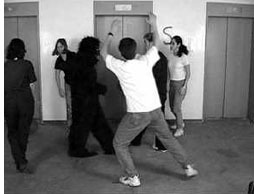 NB: 12 June 2008: In fact, the gorilla-suit experiment was conducted by Dan Simons, not Dan Levin. The last link takes you to Simons’ article. Both Dans work in the area of attention and “change blindness,” and they have collaborated on several projects. I apologize for the error. There is a registration fee for the conference’s day events, but these evening lectures are free and open to the public. Each begins at 8:00 PM and will be held in 4070 Vilas Hall, 821 University Avenue. The final night of the conference is devoted to a screening of experimental and avant-garde films that provoke questions about how we respond to cinema. There will be a discussion of them afterward, which will include two of the filmmakers, Joseph Anderson and J. J. Murphy. This screening, open to the public, starts at 8:00 PM in 4070 Vilas. During the conference, one event is devoted to a discussion of Noël Carroll’s The Philosophy of Motion Pictures. This book is a remarkable effort to mount a systematic philosophy of film, TV, and related media. It’s full of provocative claims (e.g., that cinematic movement isn’t an illusion) and nifty examples. Noël is a polymath, with two Ph. D.s and more books and articles than anybody, including he, can count. Four other scholars will criticize some aspect of the book’s arguments, and Noël will respond. (One of those critics, Lester Hunt, is a philosophy prof here who maintains a wide-ranging website and a blog that often touches on film.) There should be some fireworks. 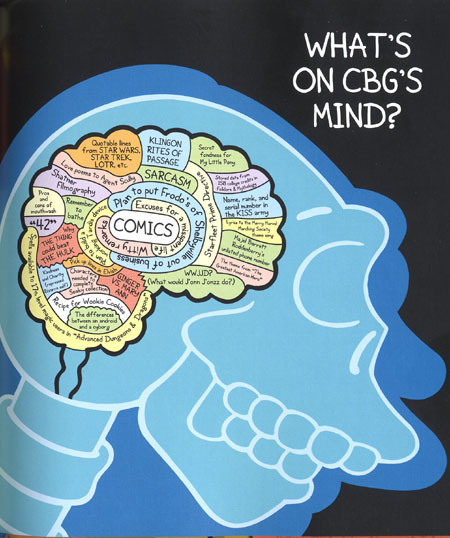 There are other brainiacs coming, many of them pioneers in this area: Joe and Barb Anderson, Murray Smith, Torben Grodal, Patrick Colm Hogan, Carl Plantinga, Paisley Livingston, Sheena Rogers, Dan Barratt, and Tim Smith (aka Continuity Boy), and too many others to include here. In all, I’m proud of what our local team, with the energetic Jeff Smith as point man, has accomplished in setting up this jamboree. As regular readers know, I think that cognitive research into cinema holds great promise. It brings together a group of scholars from different disciplines who want to understand, in an empirical way, how movies work. The field is very young, and it’s not the only way to go; but it has a lot to contribute to our understanding of media, and maybe our understanding of the mind too. Up to now SCSMI has been quite an informal group, but now we have a more systematic organization. We have officers, bylaws, and a sense that our research is coalescing around key ideas, about which there is lively and congenial disagreement. And, because there are more people who want to get involved, we’ll start meeting every year. The 2009 gathering is slated for Copenhagen. I hope to dash off a blog entry in medias res. We’ll also do our best to introduce our colleagues from overseas and from the Coasts to the glories of brats, cheese, beer, and of course The House on the Rock. By the way, you might want to check on this cognitive scientist, who claims that every one of us can see into the future (but only a little bit). Speaking of gatherings of like-minded individuals, TheOneRing.net people have invited Kristin to take part in their panel on the upcoming Hobbit project at Comic-Con in San Diego, on Friday, July 25 at 10 am. She hopes to blog from among the multitudes. There’s a new and attractive website up and running. Sponsored by the Museum of the Moving Image in Astoria, NYC, Moving Image Source is a vast project packed with links, research data, and essays about films both classic and contemporary. The first posse of writers includes Michael Atkinson, Jonathan Rosenbaum, Ed Sikov, Melissa Anderson, and other luminaries. The topics range from Andy Warhol and Howard Hawks to Werner Herzog (an interview). Steered by Dennis Lim, this is bound to be an essential watering hole for everybody interested in film history and criticism. Speaking of film history, an important film is coming to DVD. Robert Reinert’s 1919 Nerven, which I wrote about in Poetics of Cinema, has been restored by Stefan Drössler and his crew at the Munich Filmmuseum. This is one of the strangest movies of the silent era. The plot, as Chris Horak points out in his accompanying essay, is steeped in Spenglerian melancholy, reminding us that Expressionism could be politically conservative as well as revolutionary. The visuals are at once monumental and unstable, like boulders teetering over a precipice. I try to analyze them in another contribution to the DVD booklet. Drössler has contributed an essay on the process of restoration. 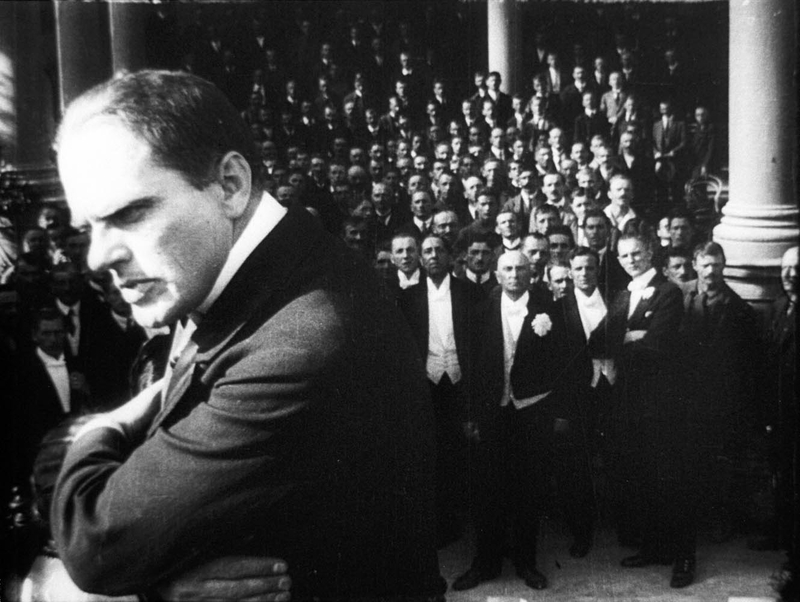 Nerven was a box-office fiasco and never achieved the fame of The Cabinet of Dr. Caligari. In a way, it is more disturbing than that official classic because Reinert’s alternation of frenzy and somnambulism takes place in a more or less solid world, like ours. Frantic scenes of street fighting mix with brooding images of a bourgeoisie sliding into religious possession or straight-up lunacy. It is not every day that you see a movie that begins with a man throttling his wife and then lovingly refilling their parakeet’s water cup. If you’re a fan of wild deep-space imagery way before Citizen Kane (as above), this one’s for you. And yes, it will have English subtitles. Nerven will be available later this summer from the Filmmuseum’s shop. It joins an abundance of other fine DVD titles, such as Borzage’s The River and a collection of Walter Ruttmann’s works. Retrospect: In Europe they do things differently? Because we see a very thin slice of foreign-language cinema, audiences underestimate the extent to which European films often imitate Hollywood. Surely the cultures of the great continent would never stoop to the crassness of our movies? A trip to any multiplex in Paris or Berlin would probably disabuse people of this notion. The current instance is the reigning French hit Bienvenue chez les ch’tis (Welcome to the Sticks), apparently a fish-out-of-water tale that would induce groans from our intelligentsia. Kristin has already written about this phenomenon here. I found some supporting evidence last week while scrabbling through an old folder for our Film History revision. It was a 2002 pamphlet from the Filmboard of Berlin Brandenburgh GmbH, a publicly limited company coordinating German state funding. The text laid out a set of guidelines, in English, for productions that the Filmboard would support. After explaining that the judges must consider financial return as well as cultural factors, the guidelines insist that the quality of the screenplay is of paramount importance. What makes a good screenplay? There must be a concrete goal, which at the end of the story is either reached—or not. There should be a risk involved for the central character in not reaching his/her goal. The goal is perhaps difficult to reach, and the struggle to do so should bring the central character into conflict. The audience sympathizes with the story when, for example, the hero or heroine follows the wrong goal, makes mistakes, or experiences a crisis. This sounds easy to understand. But writing screenplays is more complex. *The central character should have subconscious needs. He/ she should lack an important human quality and only gradually experience this for him/herself. *At the end of the story the central character should come to know his/her unconscious needs and gain a satisfactory recognition about him/herself and life in general, which can be formulated in the emotional subject matter of the film. *The central character should undergo a process of development, as characters that do not develop are boring. Moments of decision in stories are the key for good character development. The passage lays out a lot of what U. S. screenplay manuals have been asserting for decades (notions that Kristin and I have analyzed in various books). This is still more evidence that the Hollywood model, with its goal-oriented chain of causes and effects and its protagonist who improves through a “character arc,” holds sway far beyond our own shores. Whether it should be so widespread is another question, but for Kristin and me, this template or formula is a bit like the sonnet or the well-made play: a form that can yield results good, bad, and indifferent. The point is to take the form seriously enough to understand what makes it work. From Comic Book Guy’s Book of Pop Culture (New York: HarperCollins, 2005), n.p. This entry was posted on Friday | June 6, 2008 at 3:53 pm	and is filed under Art cinema, Film and other media, Film history, Film scholarship, Film technique, Film theory: Cognitivism, National cinemas: Germany, Silent film. Responses are currently closed, but you can trackback from your own site.